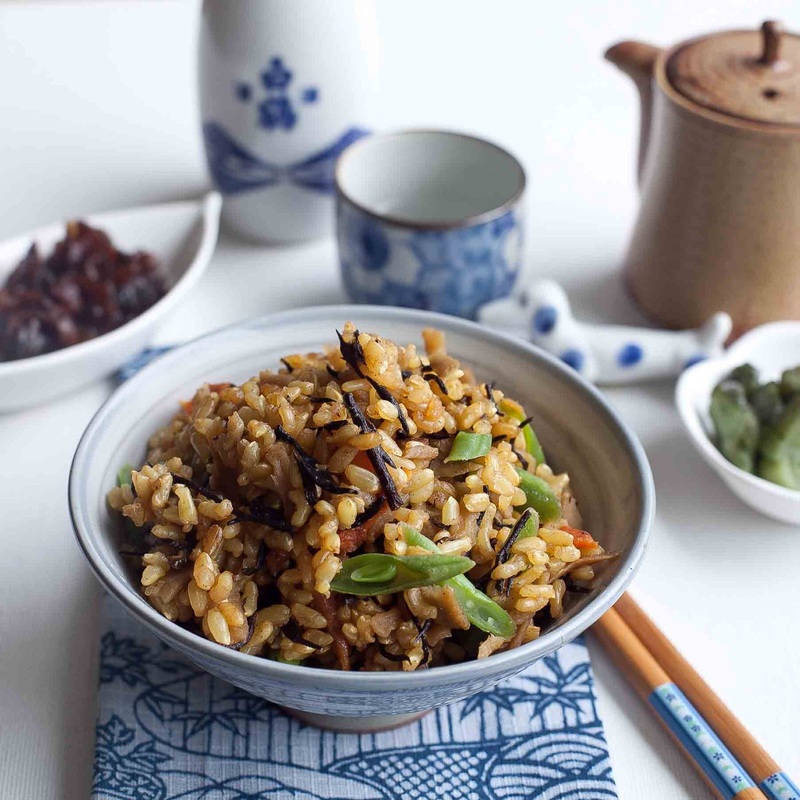 When I was growing up, we didn't have takikomi rice. We had maze gohan. 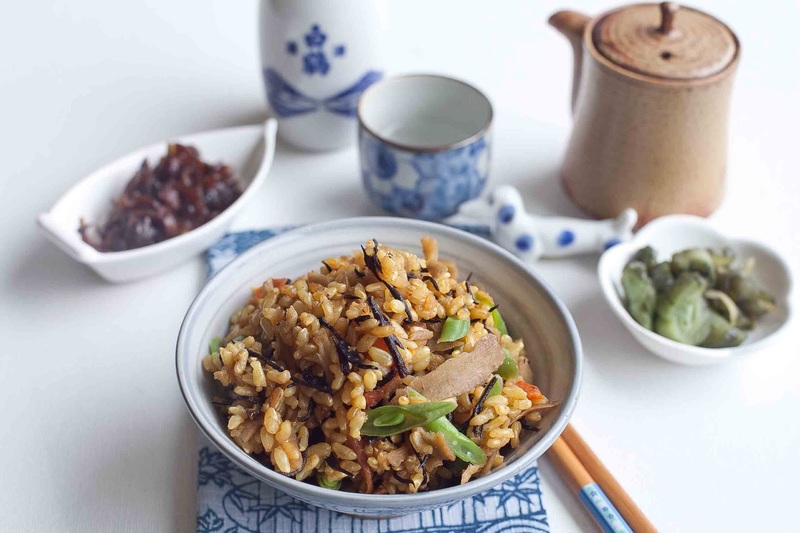 I have since learned that takikomi rice is rice cooked with the vegetables and flavorings, and maze gohan is rice with the vegetables and flavorings added after the rice has cooked. This Takikomi Brown Rice is surprisingly easy to make! 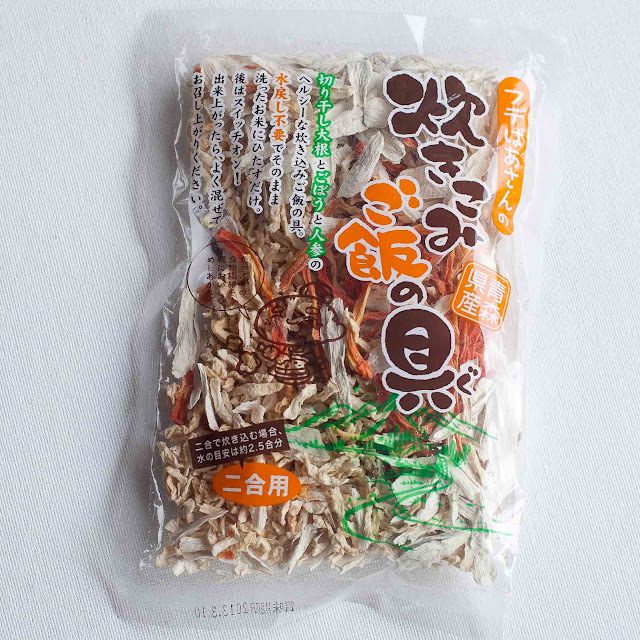 I found this package of dried vegetables while perusing the shelves at Marukai the other day. 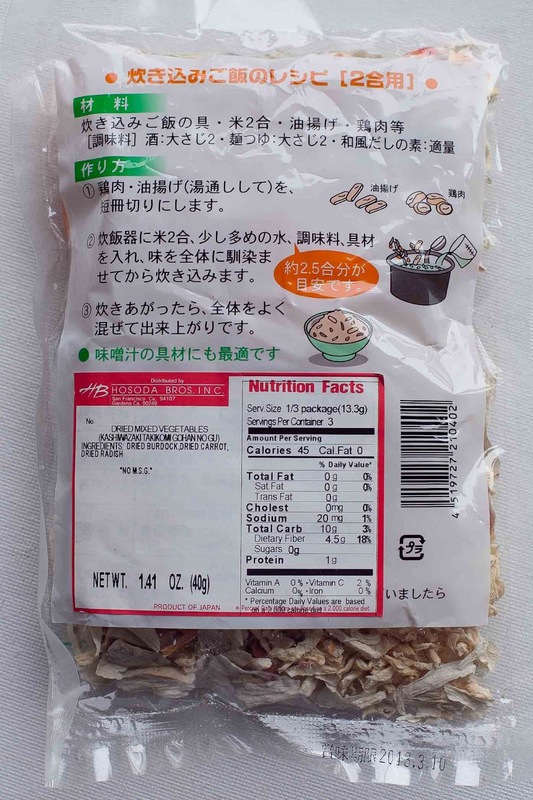 Although I don't read Japanese, the little information on the back of the package was what made me decide to try this. It's got dried burdock--gobo--dried carrot and dried radish, all of which I'd use in making takikomi gohan. 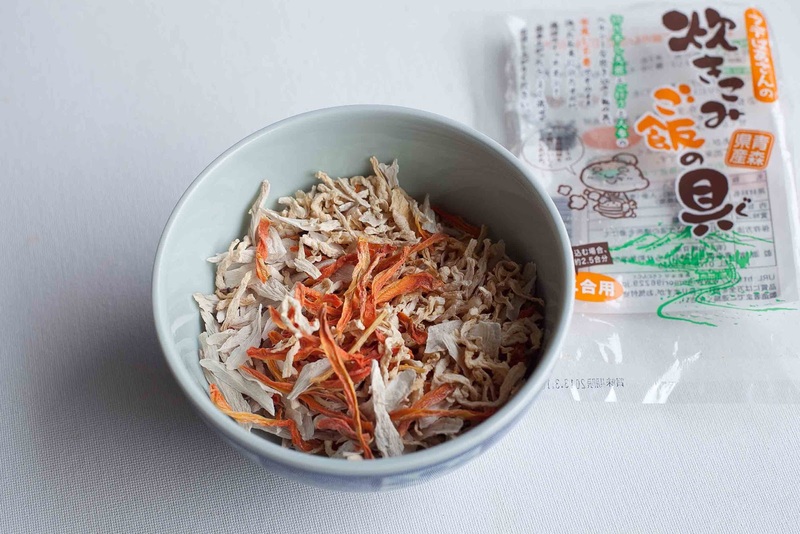 My first thought was that I should have asked someone in the store to translate the instructions for me--so this is going to be my best guess as to how to use this package of dried vegetables. 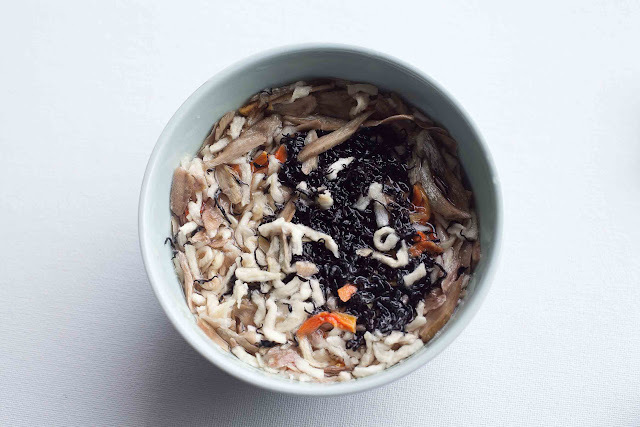 I know that if I put the dried vegetables as-is into my rice cooker, they would soak up all the water, so I added 1 cup of water to rehydrate them. I added 2 tablespoons of hijiki, thinking that it would add nice color to the dish. You can see the vegetables are plumping-up nicely. As it turns out, the vegetables need more water than just one cup. I ended up adding 1 1/2 more cups water because the rice was still hard after cooking was done in the rice cooker. 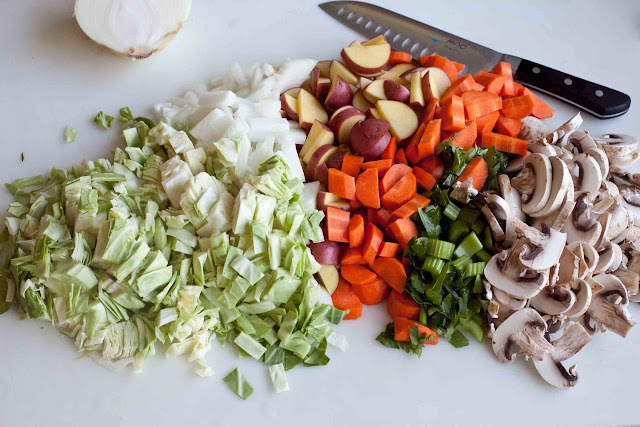 Add 2 1/2 cups water to the vegetables and hijiki while you're getting the rest of the ingredients. 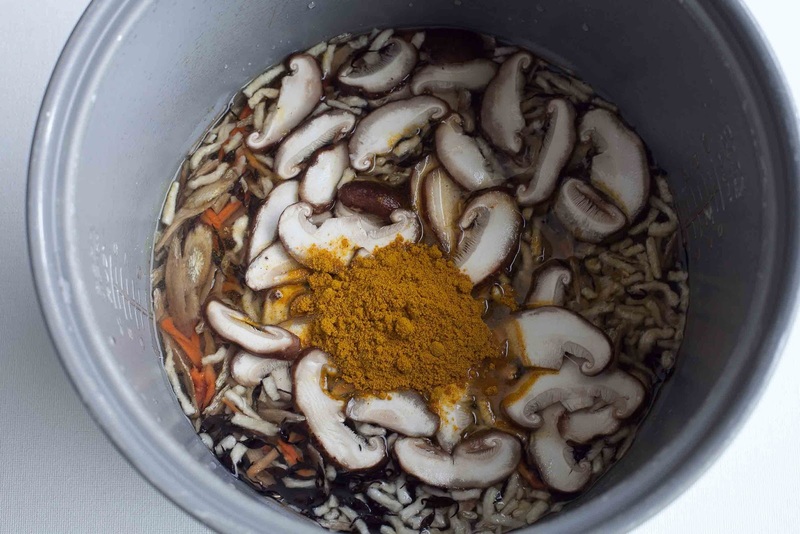 Add all ingredients to the rice cooker pot, along with 3 cups water. Be sure to add any additional water left from the soaked, dried vegetables. Stir gently to evenly distribute the curry powder, close the lid and cook! When the rice is done, let it steam for 15 minutes, then add the green beans and mix well. If you're using frozen peas or green beans, thaw them in the microwave or under warm water a little first, and mix well. She has been a guest cook a few times here on FOODjimoto.com. She made German Chocolate Cake, Grandma Kimbro's 2 Layer Cheesecake and The Best Caramel Corn. 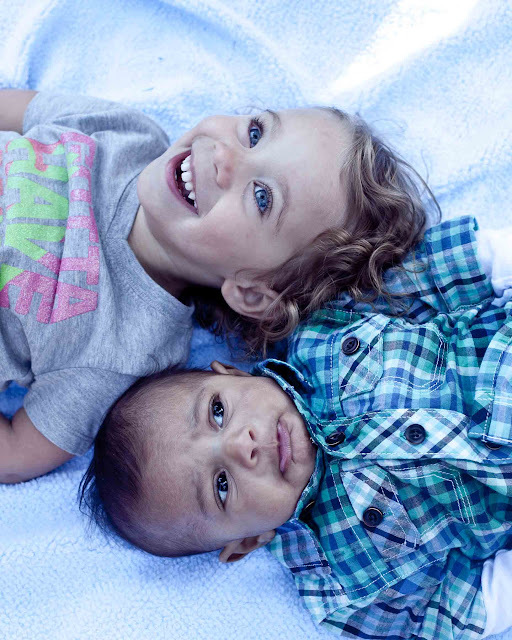 Sue's grandchildren visited a few weeks ago and I was asked to come and take some photos of their family. What a treat! Remember the Sour Cream Apple Muffins I made for the baby shower at Sue's? 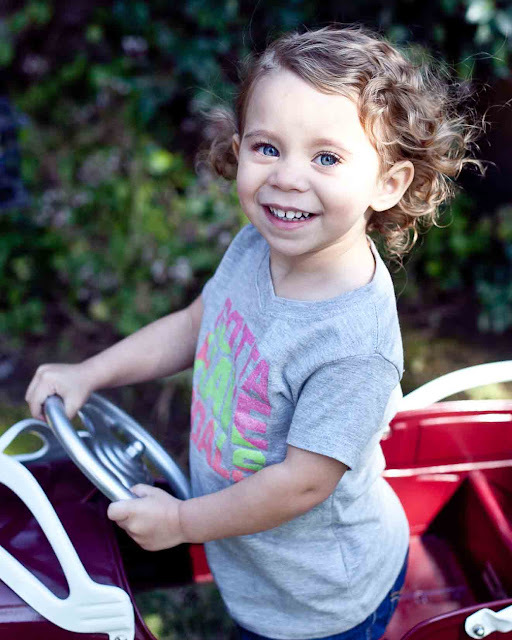 Payton is now a big sister! I just LOVE that lip! Baby teeth! I love baby teeth too. Bobby and Jen were in town for Rick & Jessica's wedding and for a nice visit home. They live on the East Coast. It doesn't seem that long ago that Bobby & Bryan were playing soccer with my son Rick. 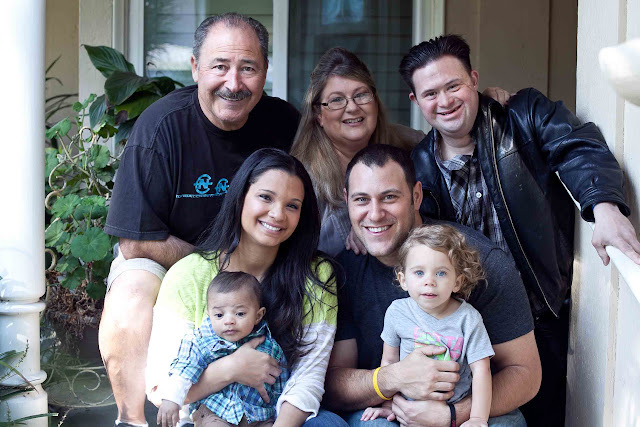 Now they're both grown and Bob's got a family of his own. 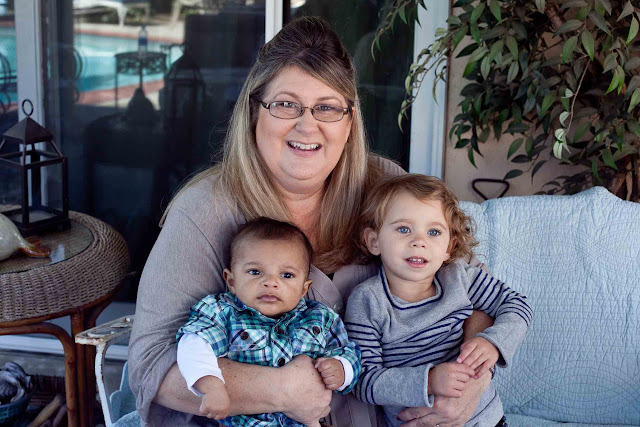 Thank you, Sue, for asking me to come and take some photos of your beautiful family! 1. 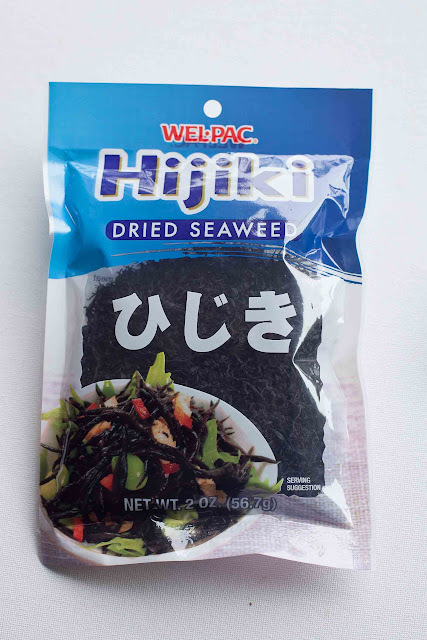 Soak dried vegetable package and hijiki in 2 1/2 cups water and set aside. 3. 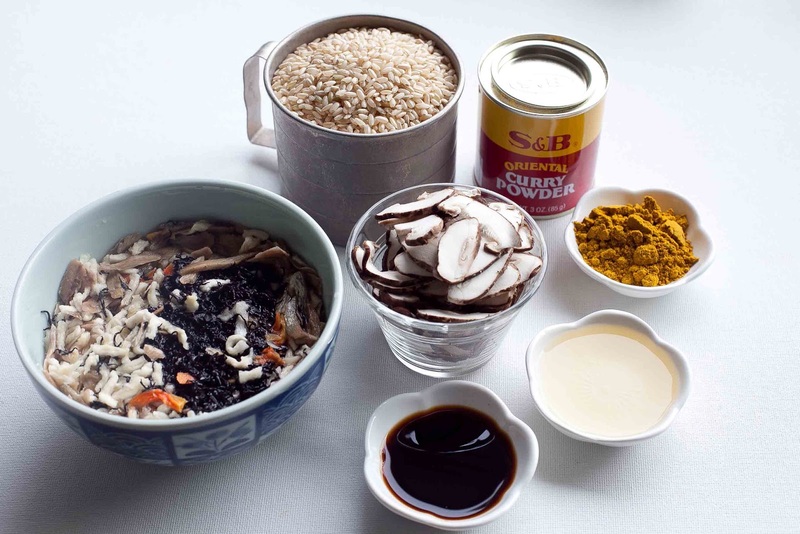 Put 2 cups brown rice, 3 cups water, sliced mushrooms, 1 tablespoon shoyu, 2 tablespoons mirin, 1 teaspoon dashi, 1 tablespoon curry powder, dried vegetables and hijiki plus any leftover water from soaking, into rice cooker pot. Stir gently to mix evenly and cook. Let steam for 15 minutes when rice cooker is finished cooking. 4. Stir in cooked green beans or peas. 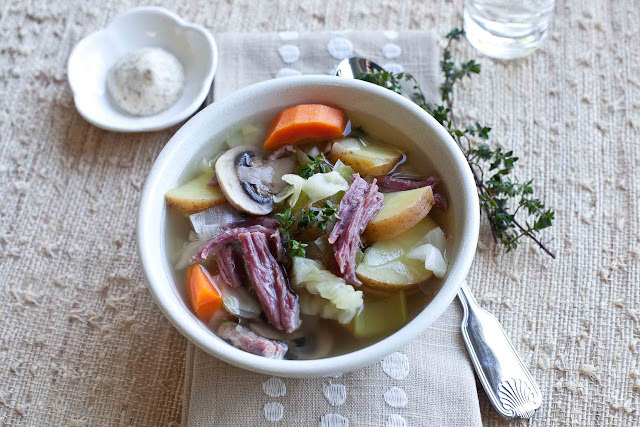 What are you having for St. Patrick's Day dinner? 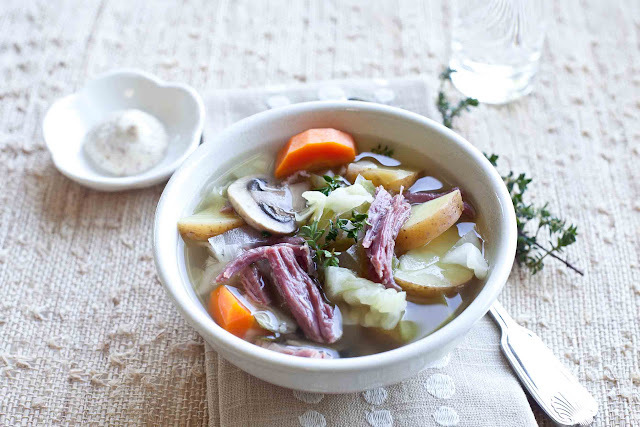 We used to always have corned beef and cabbage with carrots, onions and potatoes. 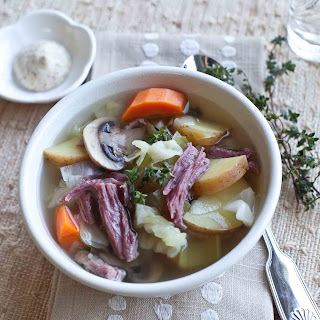 Now we're having Corned Beef and Cabbage Soup, a much lighter dinner. It's also a great way to use up corned beef and cabbage leftovers. 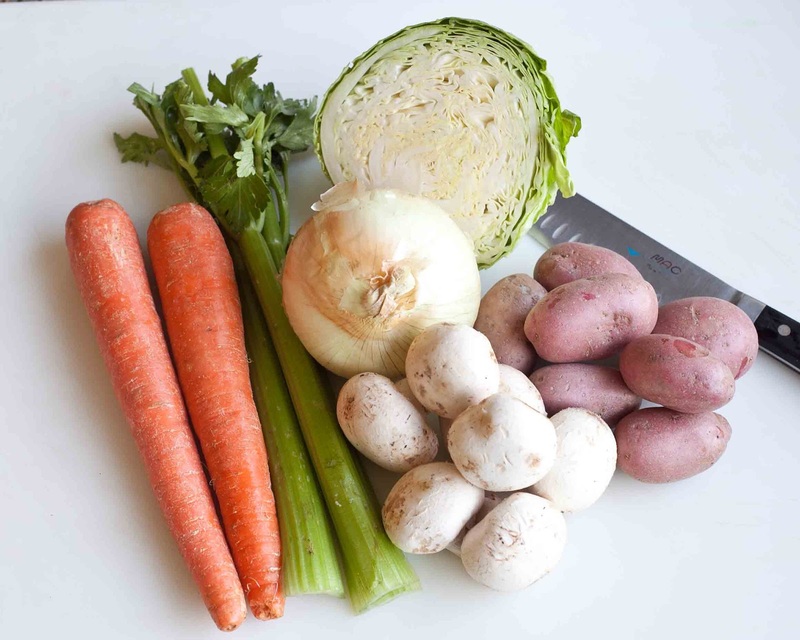 Chop the cabbage, onion, potatoes, carrots, celery and mushrooms. Add them to a large pot--this one is an 8 quart pot. 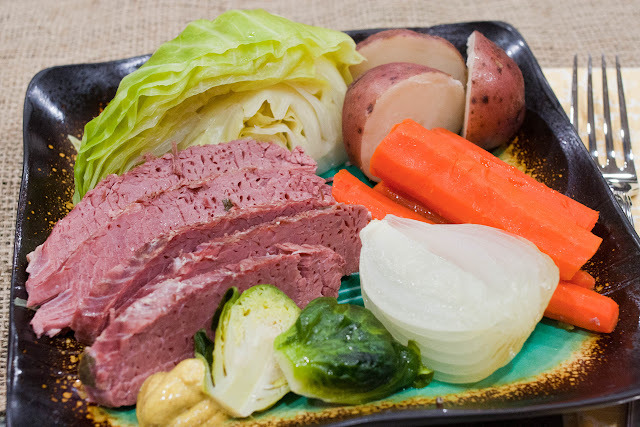 Add the defatted cooking liquid from the corned beef and add water as needed to cover the vegetables. I bought a 3 lb. flat-cut boiled corned beef. It yielded about 4 cups shredded/chopped corned beef after I trimmed away all the pockets of fat. I used 2 cups for the soup and froze 2 1-cup portions to use later. 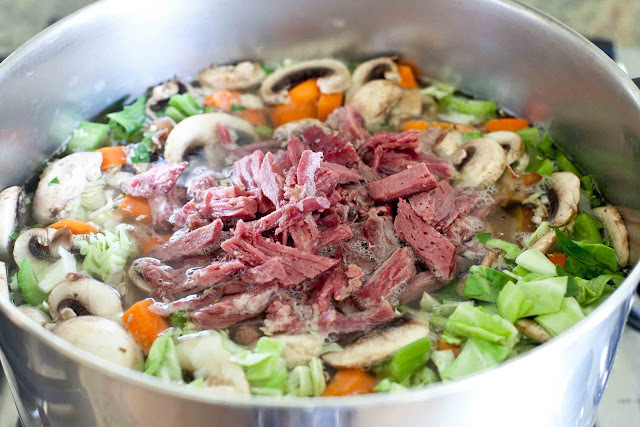 Add the corned beef pieces to the soup pot and simmer until the vegetables are tender, about 30 minutes. Season to taste. I used a little cracked pepper, but didn't add any salt. There was enough salt from using the cooking water from the meat. Garnish with a little fresh thyme if desired. I made a board book for my granddaughter, Rachel. I've made photo books before, but this is my first board book. We live far away, and I want Rachel to know us, so I thought a book about us would be helpful. It was a lot of fun putting the pages together. I used Pint Size Productions for this book and used their Simple Photo Board Book I, which made it really easy. 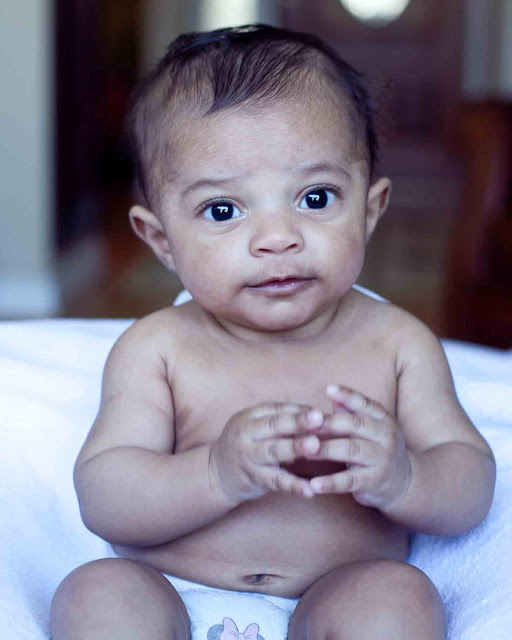 I plan on making an extended family version photo book for her in the future, so she'll know how we're all connected. 1. 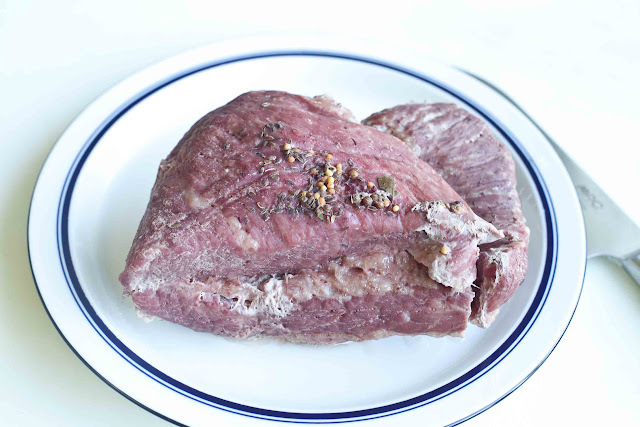 Place corned beef into a large pot and cover with cold water. Bring to boil, then cover and reduce heat to low. Simmer for 2 hours or until tender. Remove meat from pan and defat the liquid by skimming off oils floating on top of the liquid. Shred/chop corned beef and remove visible fat and set aside. 2. Chop all vegetables and put into a large pot. 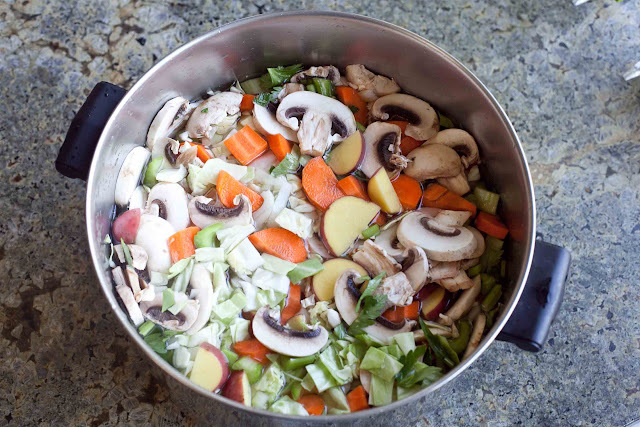 Add 6 to 8 cups of the defatted cooking liquid from the corned beef and add water if necessary to cover the vegetables. Add chopped corned beef and simmer for 30 minutes or until the vegetables are tender. 3. Season to taste; garnish with fresh thyme if desired. Does anyone remember my Easter Eggs Post? Coloring the whites of the eggs works for just about any party or holiday. All you need to do is color the egg whites in the color or colors of holidays, baby showers, or--St. Patrick's Day! You can find detailed instructions on the link above, or again, here. 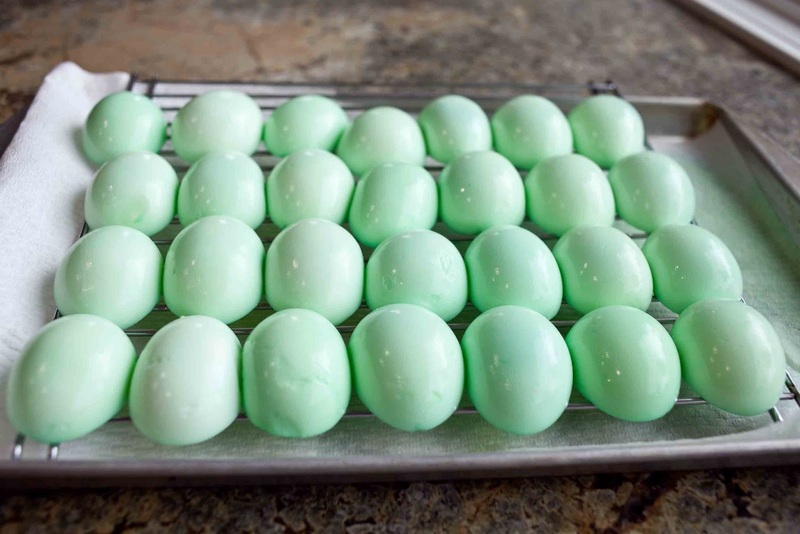 I like the more pastel green, but you can make them a darker green by adding a few drops more green food coloring or leaving the egg whites in the dyeing cup longer. 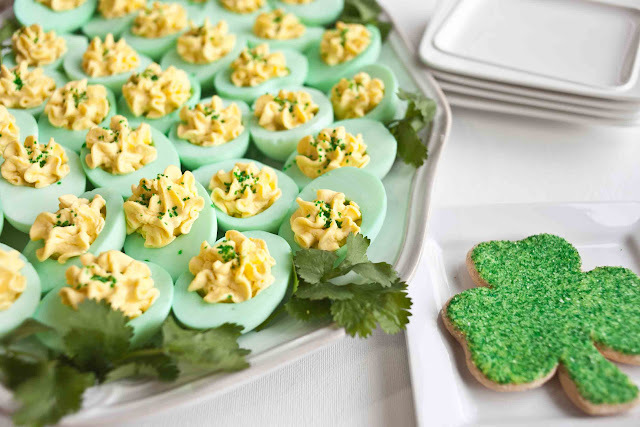 I think this would be nice for a Dr. Seuss Green Eggs and Ham party, too. Just sprinkle a little finely chopped ham or bacon bits on top of the yolks. 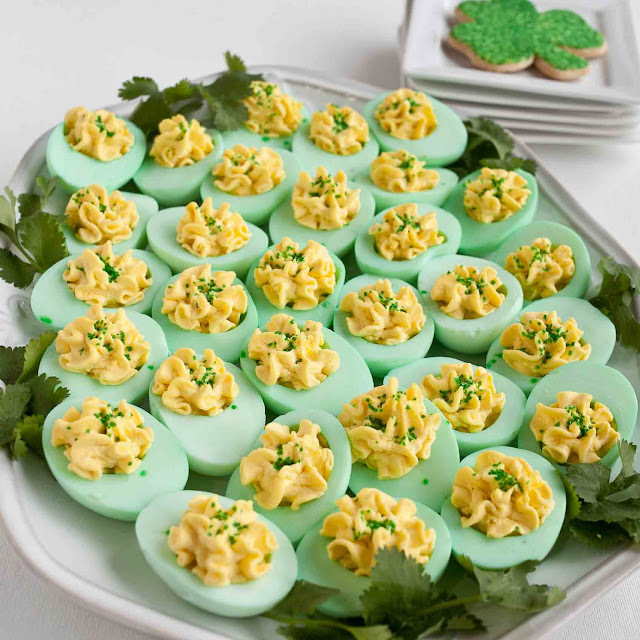 I remember my mother making Green Eggs and Ham when I was little. 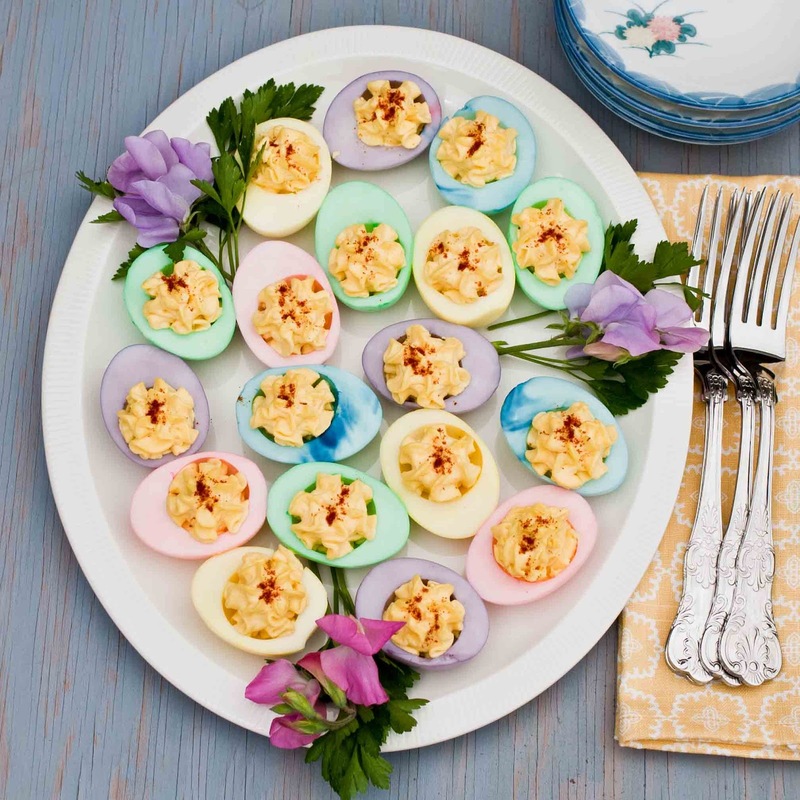 With Easter right around the corner, it's a good time to revisit our Easter Eggs post! 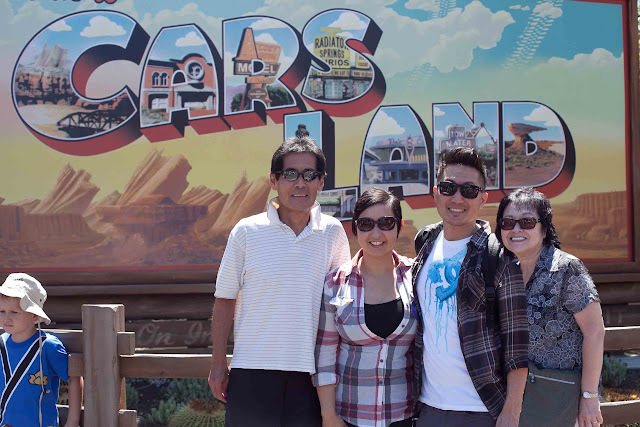 Vaughn and his wife Goretti (whom you met in my Roasted Pepper Sushi post), treated us to a day at Disneyland and California Adventure not too long ago. Vaughn is currently working on Gravity Falls, seen on The Disney Channel. It was so nice spending the day with two three of my favorite people! If you'd like, you can read a little bit more about Vaughn in my Meatloaf with Barbecue Sauce post. Here's a little clip from the Disney cartoon Gravity Falls via YouTube. In honor of Vaughn's birthday today--Happy Birthday, Vaughn!--I thought I'd visit some of his t-shirt artwork from the past. 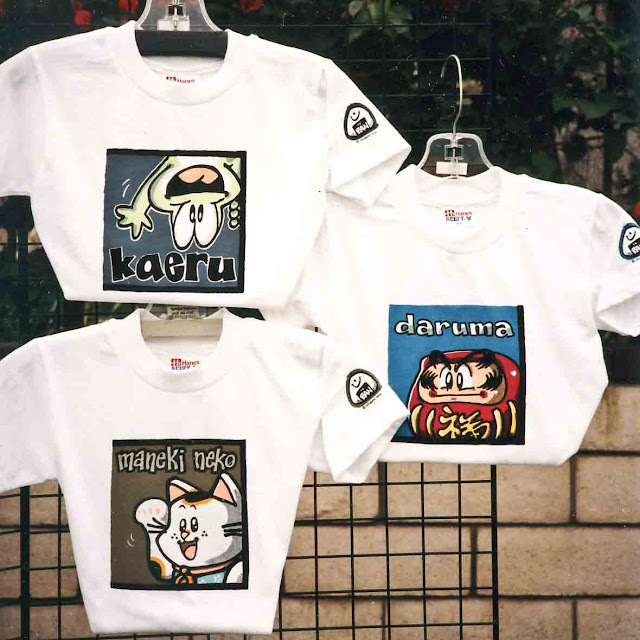 During the 90's, Vaughn designed several t-shirts for sale at the Asian craft shows in California. "Gomen!" was a favorite. Do you know anyone that pushed the insides out of a maki-zushi because they didn't like them--like Vaughn did when he was little? 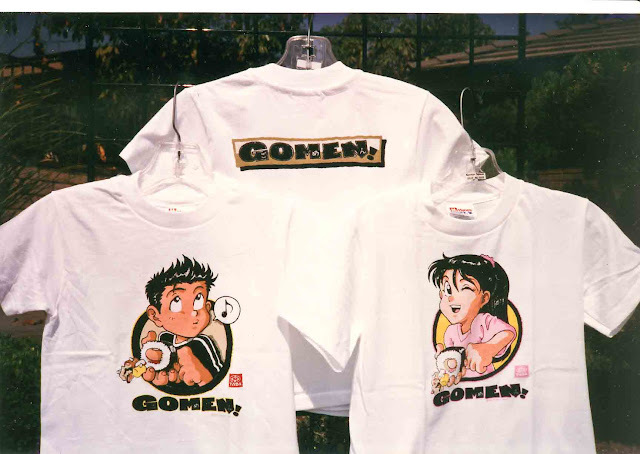 When that happens, one should say, "Gomen!" or "Sorry!". Say it like Vaughn did, with a big smile, and all will be forgiven. Vaughn also gave some drawing lessons around the time he was doing t-shirt designs. 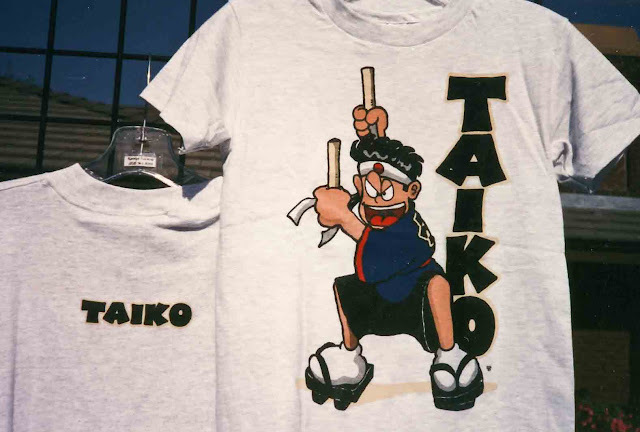 The lessons were in a style like what's shown in the Taiko design. 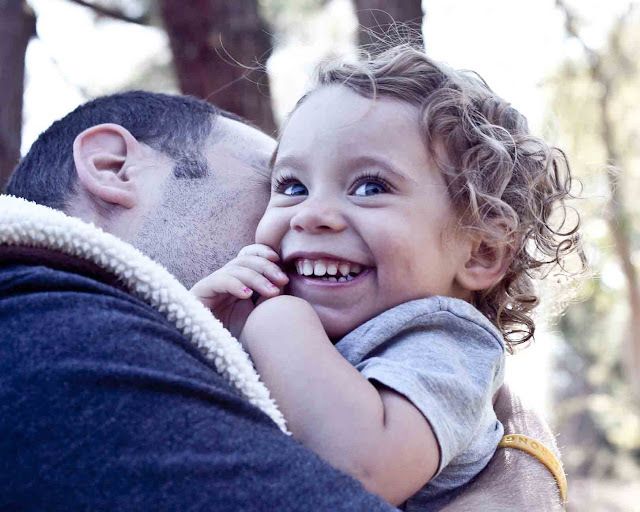 Whenever I see a former student or mother of a student, they always ask about Vaughn. Everyone knew he would gain success from his artwork! Vaughn has a great sense of humor, doesn't he! Vaughn designed this Japanese dance design when my daughter was taking odori lessons. I just love how he drew the kanzashi (hair ornament). 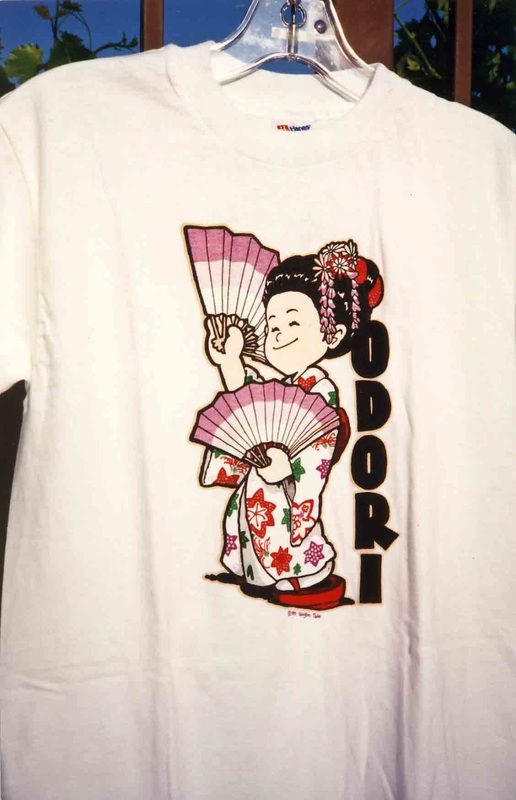 It reminds me of dressing up in kimono when I was little. Kaeru means frog in Japanese. It also means 'to come home'. My mother-in-law says that's why frogs are a lucky charm when she goes to Las Vegas to play the slot machines--the money that you put in the machine will 'come home' to you. The Daruma is a symbol of good luck. 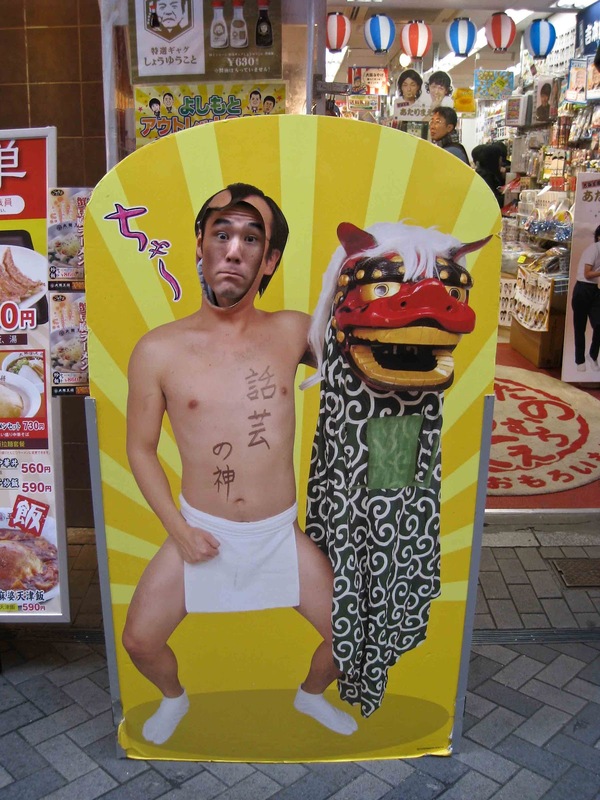 I was taught that you get a daruma doll without eyes, make a wish, and draw in the eyes when the wish comes true. They always looked kind of scary to me without eyes, so I'd draw them in first, then make a wish. 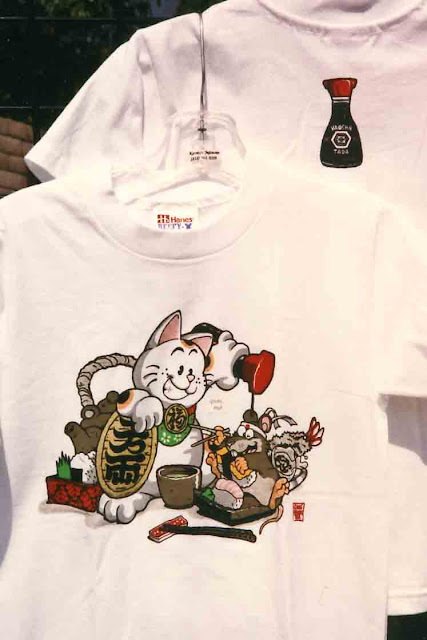 Have you seen a Maneki Neko in a Japanese restaurant or store? It's also called a welcome cat, but more like--beckoning cat. The cat, with its raised paw is beckoning one to come in. It's considered good luck too. Vaughn sets such a good example for us here at our house--he has a tremendous work ethic, is kind, generous and thoughtful--always remembering our birthdays and holidays. He lives his life with gratitude and calls or emails often to express it. He and his wife Goretti make us feel special and loved. 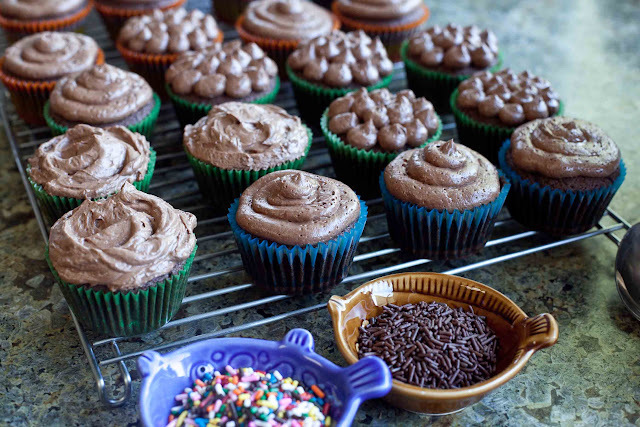 I very rarely have the urge to bake since I'm not big on sweets, but I've been wanting to try the Magnolia Bakery's recipe for chocolate cupcakes. My daughter made the bakery's vanilla cupcakes and said they were delicious! Since my husband loves chocolate, and sweets, I decided to make these. I used a piping bag with the large round tip--the frosting has some air bubbles in it, which weren't there when I frosted some with an off-set spatula. I think they're still pretty. I wonder how many times I'll need to make these to get really good at the icing. 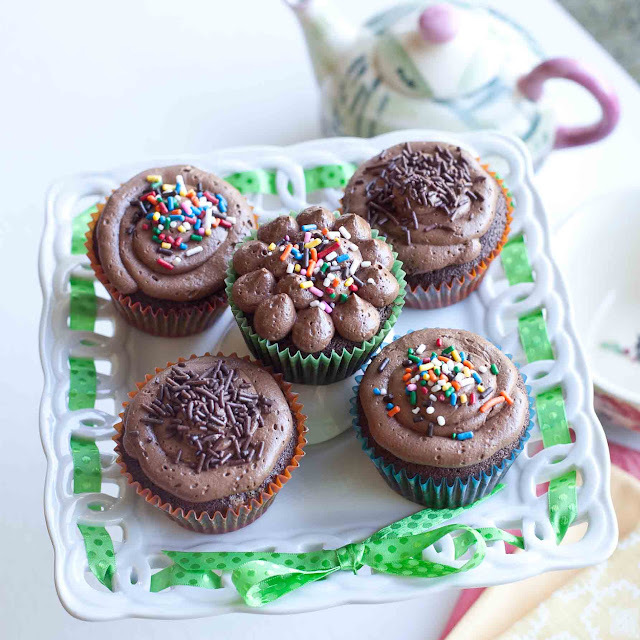 I got the Magnolia Bakery Chocolate Cupcake recipe online from food.com. Melt the chocolate first. Place the unsweetened chocolate squares in a double boiler over simmering water on low heat for 5-10 minutes. Stir occasionally, making sure no solid pieces of chocolate remain. Let cool to lukewarm, about 5-15 minutes. Line 2 muffin tins with cupcake papers and set aside. In a bowl, sift together 2 cups all-purpose flour and 1 teaspoon baking powder & set aside. Using an electric mixer, cream 1 cup unsalted butter on medium speed until smooth, then add in 1 cup granulated sugar and 1 cup firmly packed brown sugar. Beat for 3 minutes or until fluffy. Add the eggs, one at a time, beat well after each addition. 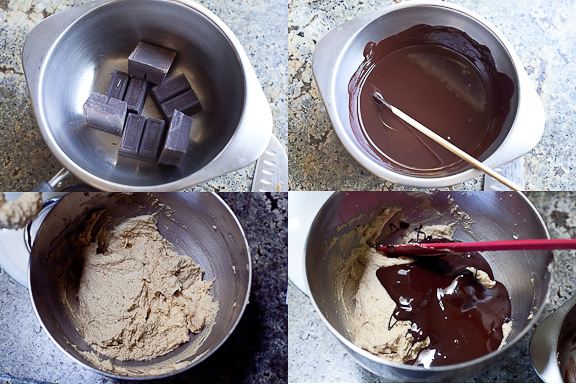 Add the chocolate and mix until well-incorporated. Add the dry ingredients, in three parts, alternating with the buttermilk and vanilla. With each addition, beat until ingredients are incorporated but do not overmix. Scrape down the sides of the bowl, using a rubber spatula, to make sure the ingredients are well blended and the batter is smooth. I found that this scooper, with a generous scoop, measures the amount perfectly and fairly neatly. 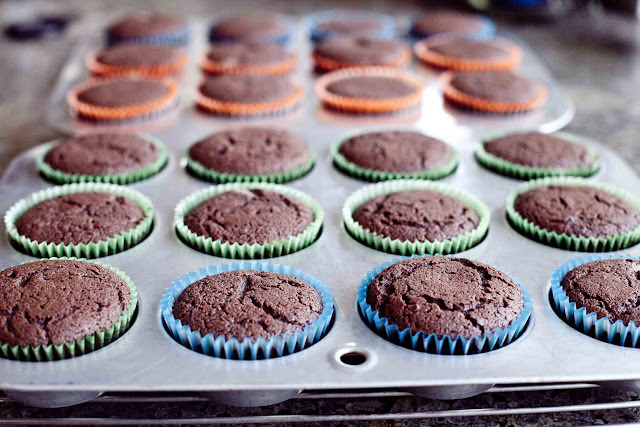 Fill cupcake papers 3/4 full. Bake in a 350º oven for 20-25 minutes or until toothpick comes out clean. Ingredients and directions below, at the end of this post. My family doesn't like a lot of frosting, so I had plenty left-over. I used the sprinkles because the air bubbles bothered me...just a little. Remember Rick & Jessica's wedding from my last post? I made the Chawanmushi because I got the new dishes, but also because The Newlyweds honeymooned in Japan! 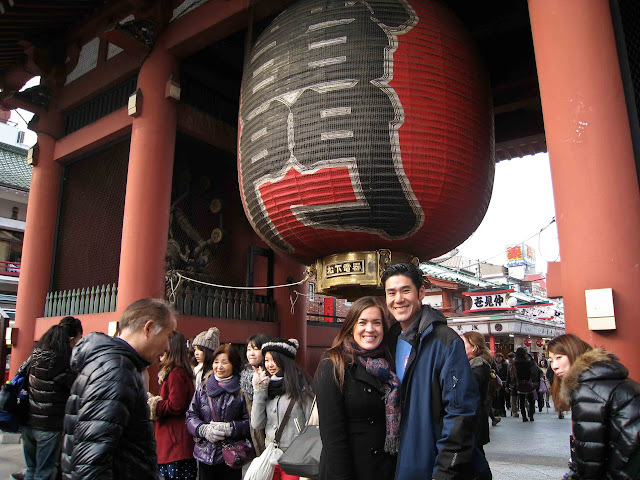 Their first stop was Tokyo, and they visited Asakusa and the temples there. Jessica is a great student of culture. She watched the people and what they were doing to learn what to do herself. 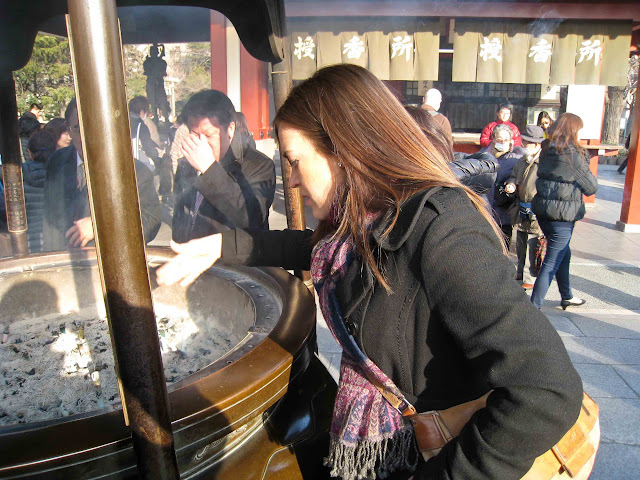 Here, she's wafting the incense onto herself--it's an act of purification. Hand washing before going to the temple is also for purification. Use the tip of the handle only to scoop the water to wash your hands, never touching the cup to your body. 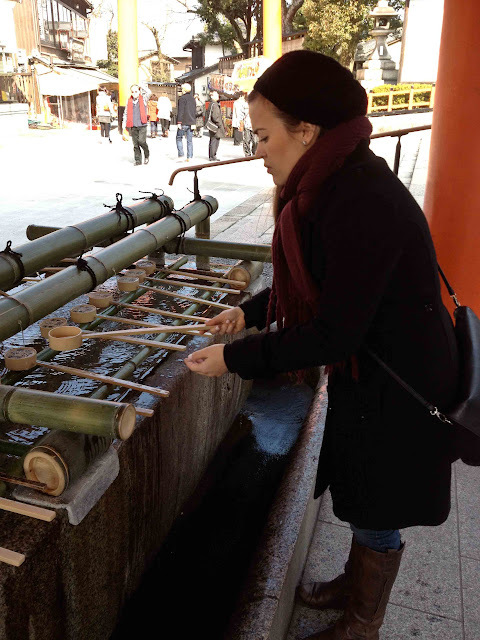 Pour the water onto your hands outside the well where the water is. You may also drink, but be careful not to touch the cup to your lips. Jessica loves electronics, and here she is in the electronics area of Tokyo. 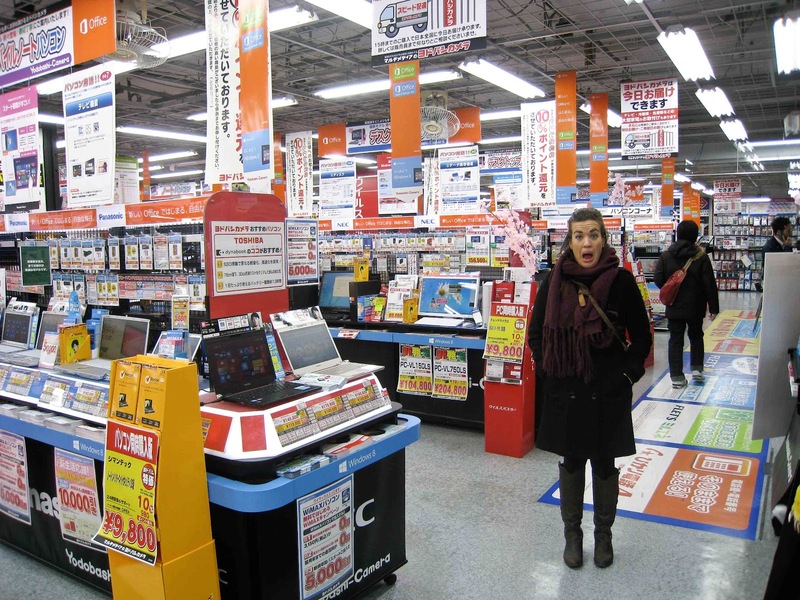 Her expression reflects her awe at all the electronics AND all the advertisements! 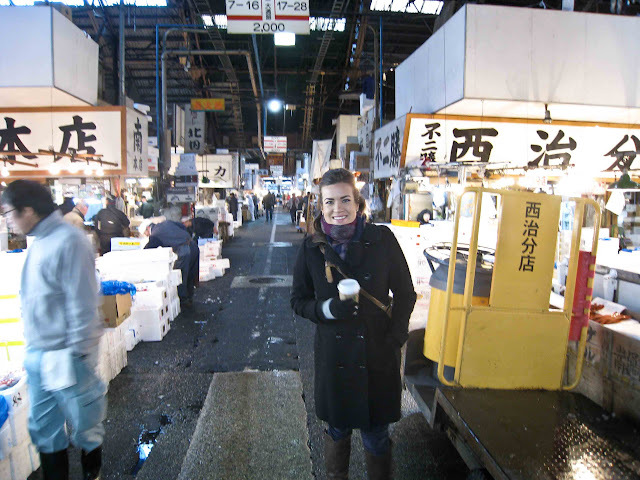 The Newlyweds said a highlight of Tokyo was the Tsukiji Fish Market. Jessica & Rick saw the movie Jiro Dreams of Sushi and were looking forward to seeing the fish market. They had breakfast at one of the stalls just outside the market--the 'Chef's Recommendation Morning Special' hit the spot. 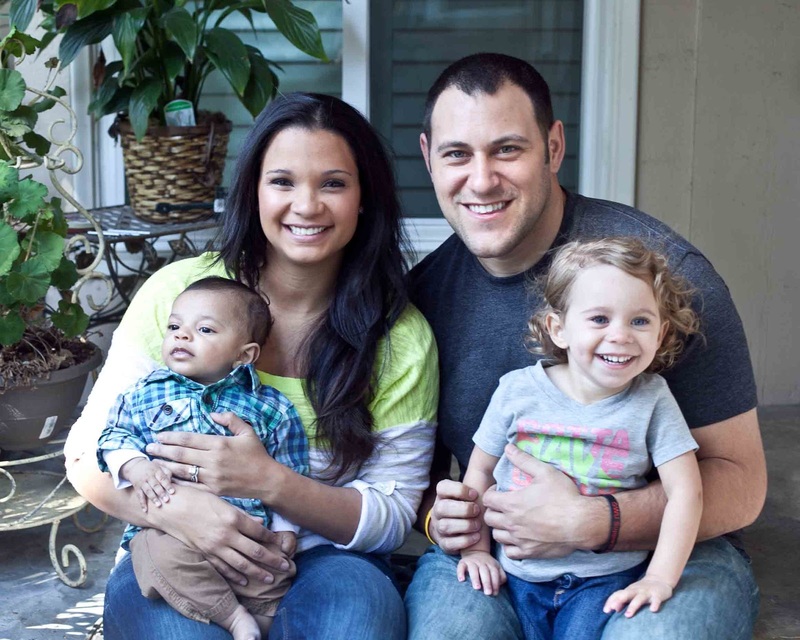 We are so happy to have Jessica a part of our family! Jessica's a crafter--a jewelry maker. 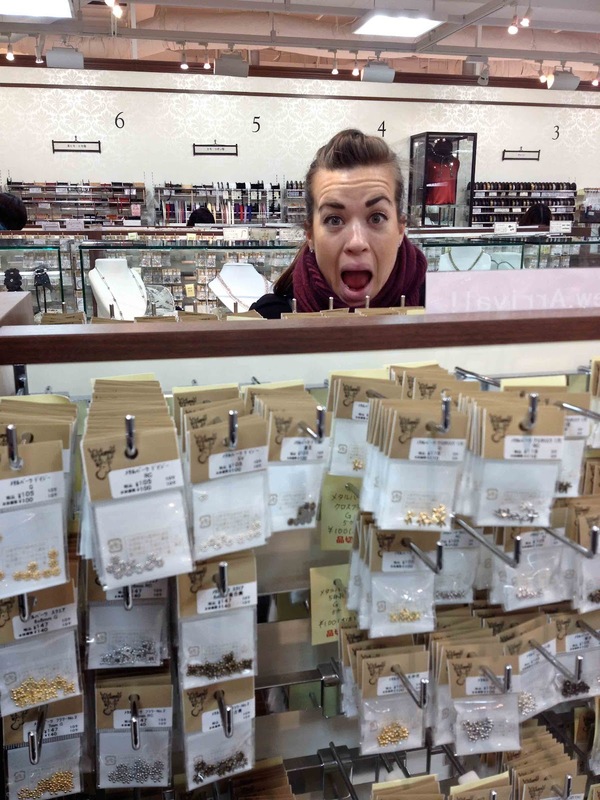 She's visiting the bead section of a craft store and by her expression, you can tell she's excited! 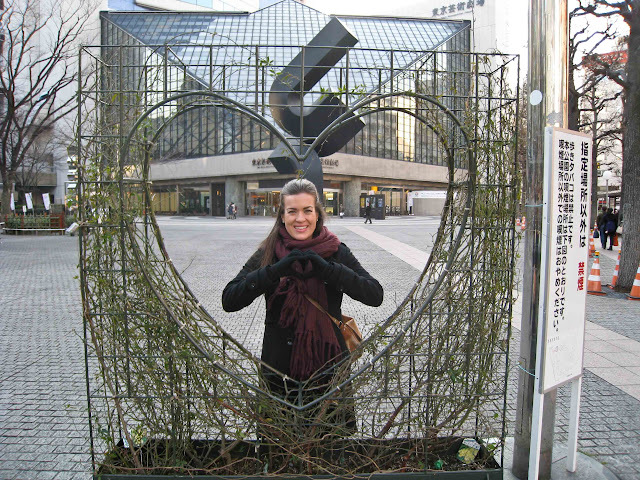 After Tokyo, the newlyweds went to Osaka, to visit Kanako, a not-so-distant relative who visited us a couple of summers ago. 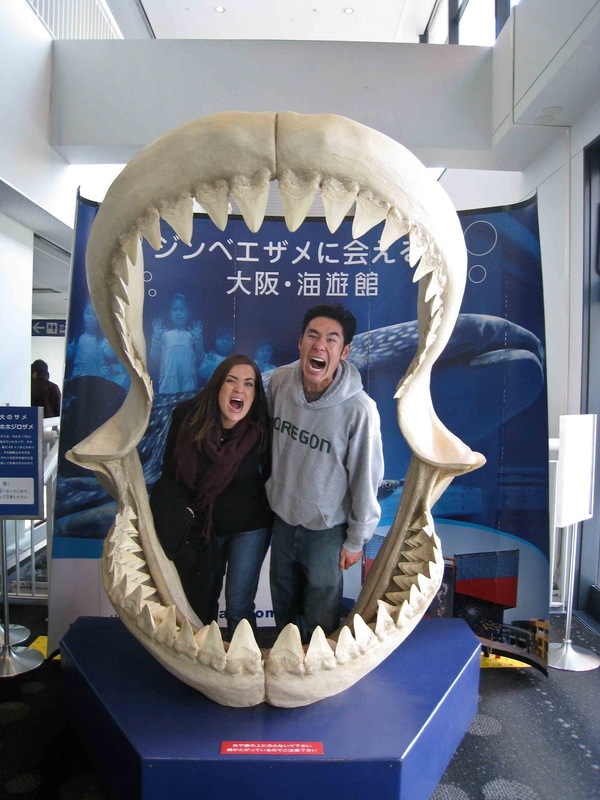 They went to the Osaka Aquarium Kaiyukan. 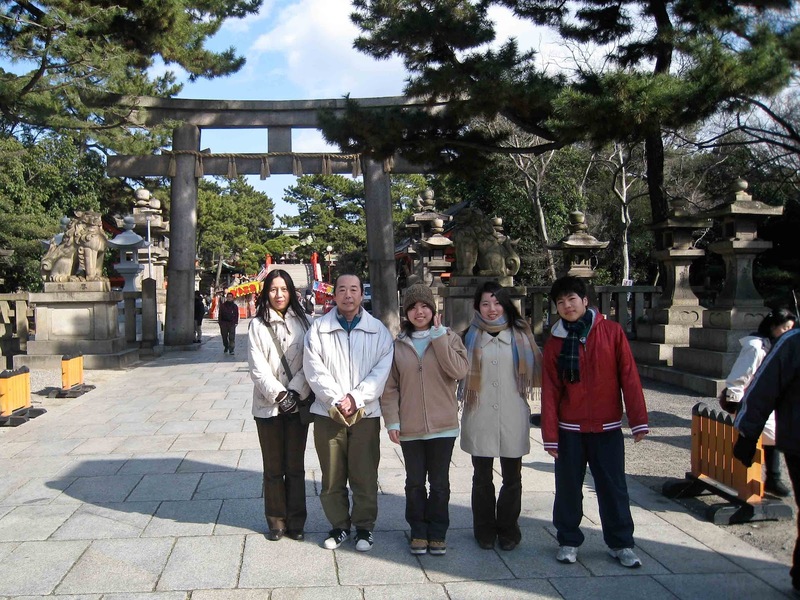 This is Kanako's family, the Kurimotos. 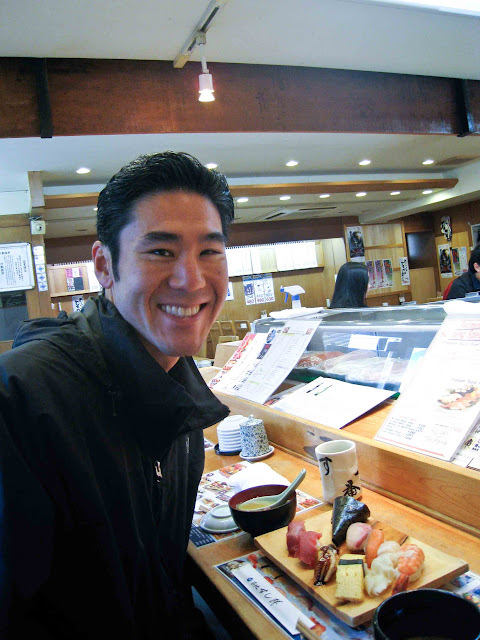 Hiroshi-san, Kanako's father, lived in the Los Angeles area for several years in his youth. A big "Arigatougozaimashita!" 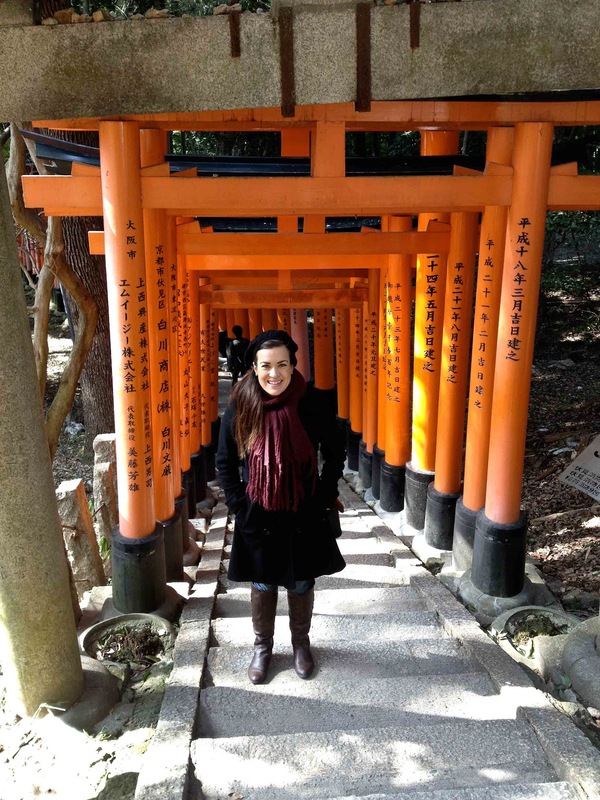 goes out to the Kurimoto family for their hospitality during Rick & Jessica's visit. After Osaka, they traveled to Kyoto and visited more temples. 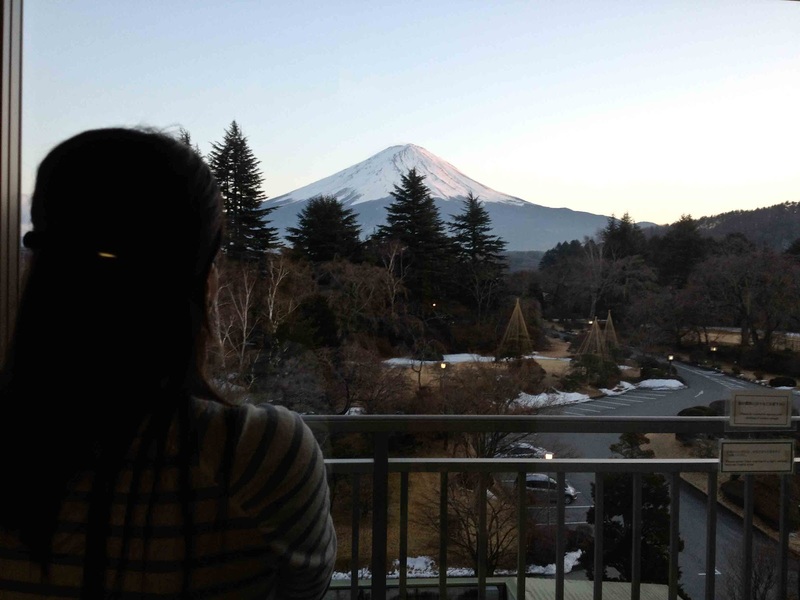 The end of the honeymoon was a relaxing stay Kawaguchi-Ko at a ryokan--a traditional Japanese inn--with a spectacular view of Mt. Fuji. 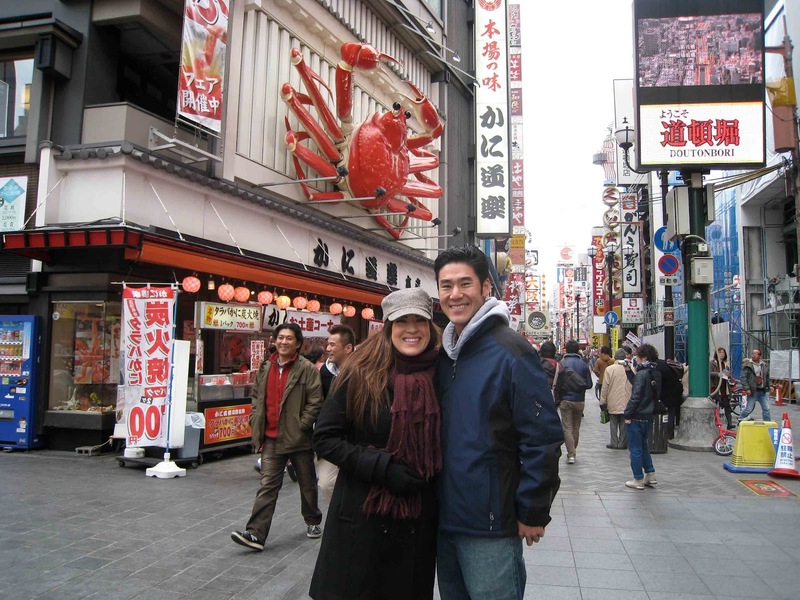 The Newlyweds had some gourmet dinners there, too, as well as their first onsen--Japanese hot springs--experience. Thank you, Rick and Jessica for sharing your honeymoon photos with us. What a great experience for the two of you. Best Wishes and Congratulations as you begin your life together! 1. 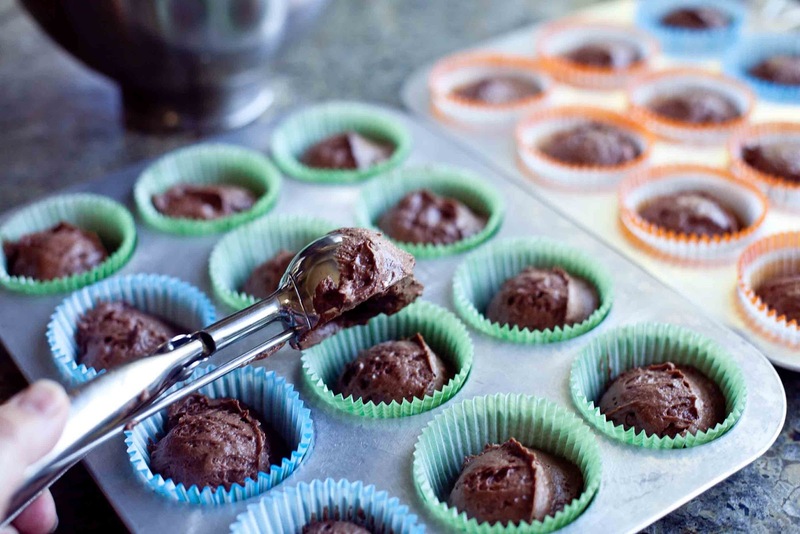 To melt the chocolate, place unsweetened chocolate squares in a double boiler over simmering water on low heat for 5-10 minutes, stirring occasionally until completely smooth. Remove from heat and let cool for 5-15 minutes or until lukewarm. 2. 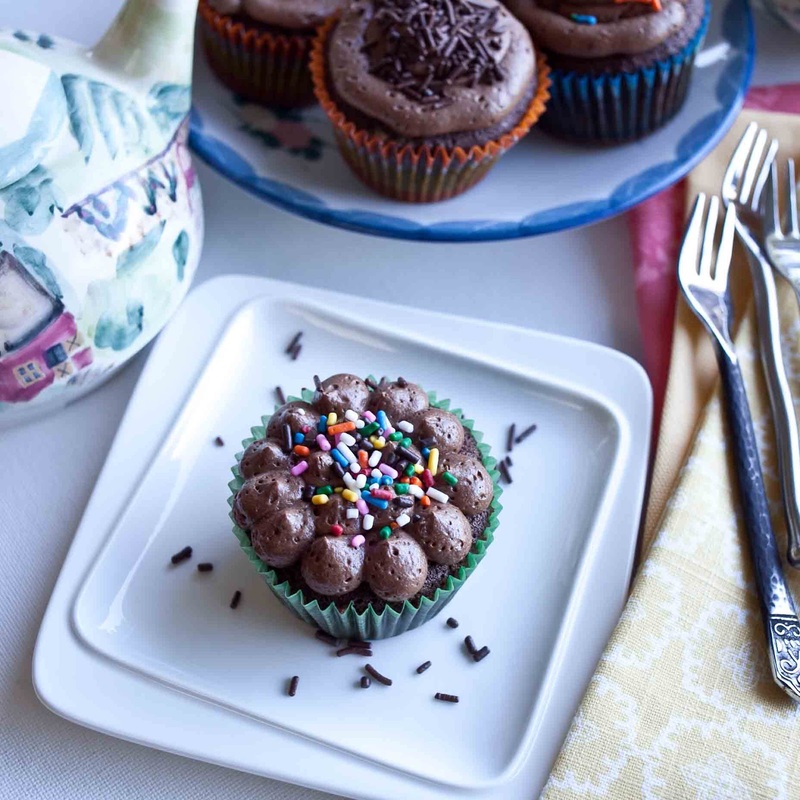 Line two 12-cup muffin tins with cupcake papers; set aside. 3. In a bowl, sift the flour and baking soda together; set aside. 4. 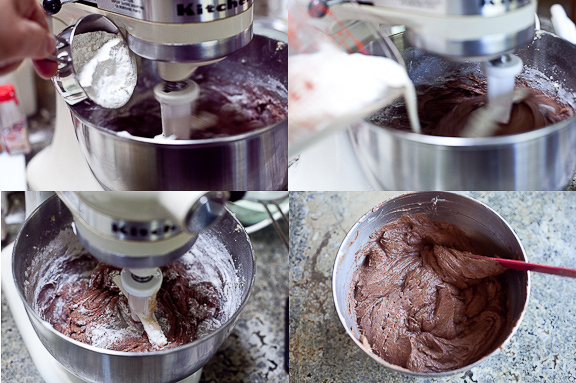 In a big mixing bowl, cream the butter, using an electric mixer on MEDIUM speed, until smooth. 5. Add the sugars and beat for about 3 minutes or until fluffy. 6. Add the eggs, one at a time, beat well after each addition. 7. Add the chocolate, mixing until well incorporated. 8. Add the dry ingredients, in three parts, alternating with the buttermilk and vanilla. 9. With each addition, beat until ingredients are incorporated but do not overmix. 10. Scrape down the batter from the sides of the bowl, using a rubber spatula, to make sure the ingredients are well blended and the batter is smooth. 11. 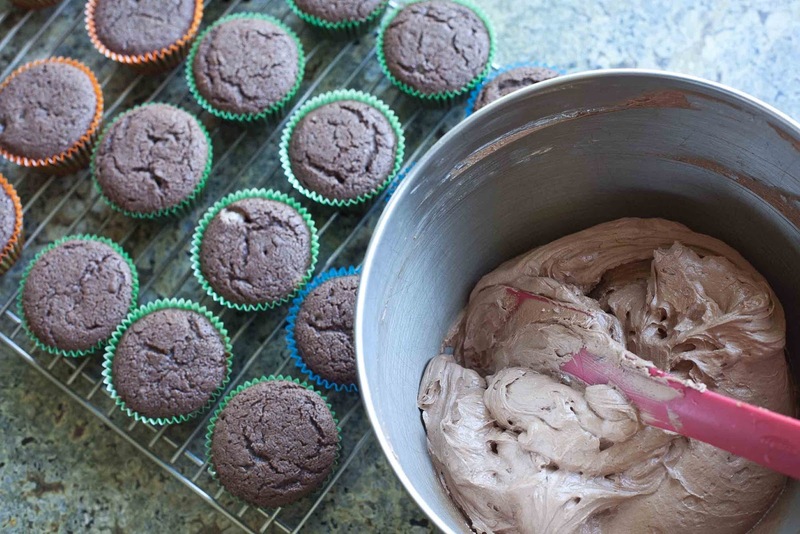 Carefully spoon the batter into cupcake liners; fill 3/4 full. 12. 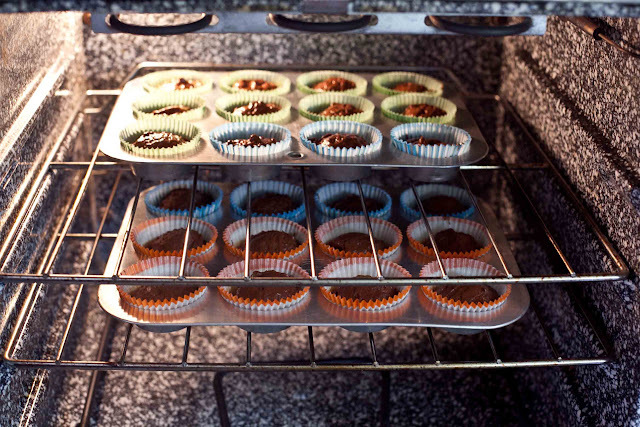 Bake in a 350º oven for 20-25 minutes or until pick comes out clean. 13. Cool in tins for 15 minutes. 14. Remove from tins and cool completely on a wire rack. 15. Ice when completely cool. 1. Note: to melt the chocolate, place semisweet chocolate into a double boiler over simmering water on low heat for 5-10 minutes; stir occasionally until the chocolate is completely smooth and no pieces remain; remove from heat and let cook 5-15 minutes or until lukewarm. 2. 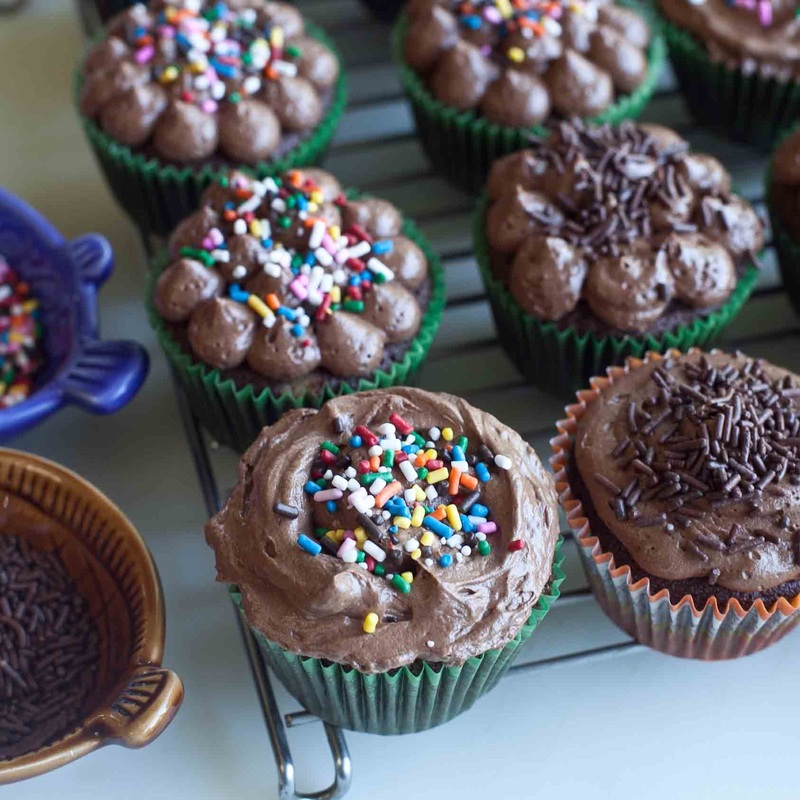 To make the buttercream: In a large mixing bowl, beat the butter using an electric mixer on MEDIUM speed for about 3 minutes or until creamy. 3. Add the milk carefully and beat until smooth. 4. Add the melted chocolate and beat well for 2 minutes. 5. Add the vanilla and beat for 3 minutes. 6. Gradually add in the sugar and beat on LOW speed until creamy and of desired consistency. 7. **For icing a 3-layer cake, use the following measurements: 2 cups unsalted butter, 3 tablespoons milk, 12 ounces semisweet chocolate, 1 1/2 teaspoons vanilla extract, 3 cups sifted powdered sugar.